I have been seeing so many posts about freezer meals recently. One thing that has surprised me the most about freezer meals is that they take a lot of work! All of the posts make it seem easy and time saving but I’m not buying it. You take hours one day to prep all of your meals and put them in the freezer. Then, when the time comes to prepare your meal, you still have to find the right cookware and thaw and cook it which could take just about as long as just starting from scratch. I’ve been doing my own version of freezer meals for years. The difference is that I completely cook the food before I put it in the freezer. I remember being young and my mom would do this with things like chili, spaghetti and meatballs sauce, and sloppy joes. She would freeze portions for one family meal already cooked and just needing to be reheated. Now, I don’t have ‘family meals’ in my household because Nick and I are hardly every home to eat at the same time. So, I prepare all of the meals for the week or longer on one day and then All we have to do is microwave and put the container in the dishwasher. One thing to note is that I only do this with foods that work well freezing and reheating. I use two types of tupperware for my meals. The larger tupperware are the ones that come with lunchmeat in the deli section. The smaller ones are in the image below. I thought I’d share an unedited photo to show that this is not a perfect process. Portion size is different for Nick and I but this made enough food for each of us to have 16 meals. In the back left, there is a stack of small and large tupperware. These have turkey noodle casserole made with left over turkey and spaghetti. The middle tupperware have Oven Chicken with Tomatoes. The two stacks of tupperware on the far left have Honey Soy Pork and some Teriyaki chicken just made with a store-bought sauce. I used Ellie’s recipe to make a dough for all of the items in the front. One thing to note is that I did not let the dough rise for a second time for any of these meals. 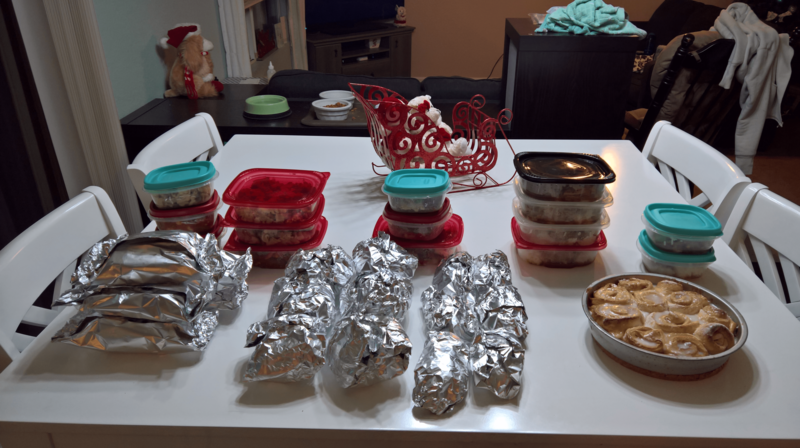 On the far left front, There’s wrapped leftover turkey and cheese. The two wrapped meals in the middle are both BBQ Uglies just made in a different shape. For the left ones, I used a large muffin pan and for the right ones I used a small pastry press. Of course, I had some extra dough and decided to make cinnamon rolls. These were not part of the freezer meals but definitely part of my reward for doing all this cooking in one evening! Do you make freezer meals? If you do, do you cook them before or after you freeze them? I just had a new baby so freezer meals are life! I’ll try these! Thank you for all of these recipes that I will for sure be making this weekend 🙂 Very helpful and much appreciated! I love cooking once and eating twice or several times. Freezing them makes my life so much easier. I love freezer meals, sometimes its the only way we make it through a week, because with 2 kids it’s just so crazy! Thanks for the ideas! Freezer meals are hit and miss at my house. Some things reheat well and other things don’t. Many times we forget that we’ve made something in advance, and it gets thrown out weeks later due to frost burn. 🙁 It’s awesome that you’ve been able to make it work for you. You are much better organized with your freezer meals than I ever am :-). But these are such time savers !!! Have to try some of these meal ideas !!. 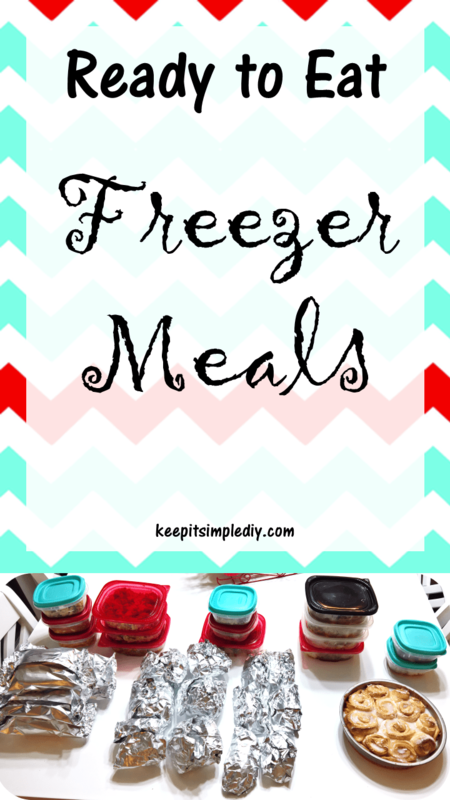 I love freezer meals and I am trying to put a few more of them in my freezer. When you have kids, freezer meals are literally what keeps the family fed! I want to be better about this and make more recipes to give them a variety. Thanks for sharing our tips! I need to start doing this, mostly because I hate cooking every day lol! Freezer meals are so awesome. I love prepping everything on the weekends and just storing the meals for later on in the week.